We offer CHEAP and CONVENIENT private rooms in the middle of Shinjuku. Please feel free to inquiry me. The nearest station is Higashi-Shinjuku station. It takes only 2min from there to our hostel. Shinjuku-sanchome station and JR Shinjuku station is close as well. The room is private. Only the toilet, the shower and the kitchen are shared. 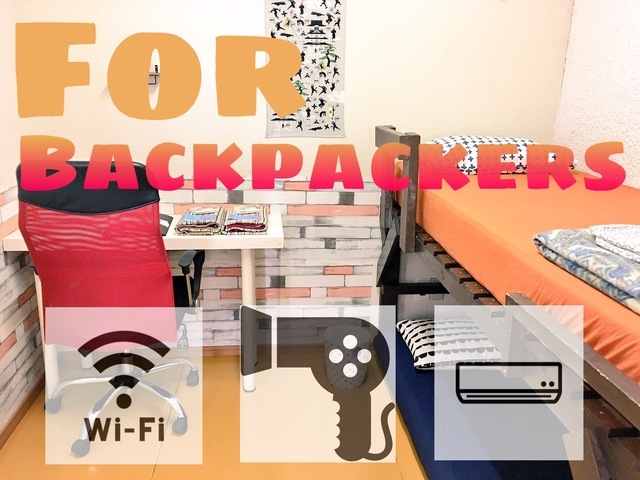 Check In/Check Out : This is a self checkin type hostel. After your reservation is confirmed, we will send you an instruction for self checkin. Checkin is possible from 4pm to anytime. "We provide for free shampoo/soap/tissue for your first night. We can provide more with extra fee so please feel free to contact us if you would like to have more. * NO PARTY ALLOWED in the room and in the building. * NO SMOKING in the room. There's a smoking area in the building. * NO VISITORS ALLOWED - Outsiders are prohibited. Only people who booked a room are allowed in the premises. * TURN OFF / PLUG-OUT all electrical devices when you leave the room. * KEEP QUIET - especially at night. NO LOUD TALKING and MUSIC. Disturbing other guests will cost penalty fee. * KEEP CLEAN - always keep the common areas clean. * Keep your personal belongings in your room. * DON'T LEAVE TRASH in the common spaces. THROW THEM in the trash place when you check-out. * LEAVE THE ROOM KEY ON THE TABLE WHEN YOU CHECK-OUT. MISSING or ACCIDENTALLY BROUGHT THE KEY COST ¥10,000 AS A PENALTY FEE. [ Penalty ] We trust that people are responsible for their own act therefore people who broke the rules intentionally or unintentionally, we collect penalty fees more than 10,000yen. For example; Visitor Lost keys Damage to the property (sheets stain, big scratch on the wall, or on the floor, at the furniture etc) Abnormal behaviour under drug / alcohol "
What to see & do : The biggest city of Tokyo. Shinjuku/Kabukichoo is famous for entertain city. You can enjoy Japanese style drinking bar in Kabukicho Golden Gai. Also, there is a big department store, ISETAN. It takes 5minutes walk from our guesthouse to ISETAN. So you can enjoy your shopping as well! We will send you an instruction for self checkin after your reservation is confirmed.